Are you looking for a great business opportunity in Louisiana? You do not need to go far because The BBQ Cleaner can help you get started. Before you even freak out about this business opportunity thinking that costs can be very high and years of experience is needed in order to operate one, think again. The BBQ and grill cleaning industry does not require hefty startup costs. It does not require years of experience to be able to operate and manage one as well. Just to clarify, we are not a franchising business thus you will not need to pay any royalty fees whether monthly or annually. Think of the many residents in Louisiana who have been requesting our services in the past but due to the lack of people in our team, it was very difficult to bring our services to them. Now, with someone like you who is eager to earn from an already established business, it will be easy to reach out to these people. This will definitely open doors of opportunities for you to grow your business. We are just here at The BBQ Cleaner to assist you. Why Start a BBQ Cleaning Business in Louisiana? Favorable Weather Conditions: Summers in Louisiana are generally hot and humid with mild winters on the side thus you can be sure that families are spending most of their time grilling outdoors. This will mean more money for you and your business since it will be easy offering grill cleaning services to them. Large Customer Base: Many homes in Louisiana have their own grills that they can use whenever they want. What does this mean? It will be easier for you to grow your business by making money from these potential customers. Scarce Competition: The BBQ and grill cleaning service is not that tough as compared to other highly competitive niches in the state. You can definitely look forward to growing your business even more. Grow Your Business Only When Needed: Hire staff and add vehicles to your fleet once you have a feel of how the BBQ and grill cleaning business grows in the area. How Does The BBQ Cleaner Help You Get Started in Louisiana? Our all-in-one package alone can already help you get your business started. As you move on to the next stages of the process, you can be sure that you will get help from the BBQ Cleaner through our on-going lifetime business support. Since our inception in 2009, we have already reached out to a lot of communities with over 180 operators helping us nationwide. We are regarded as a global leader in the BBQ and grill cleaning industry thus you can be sure that there is no one better than us when it comes to unleashing unlimited earning potential for your grill cleaning services. 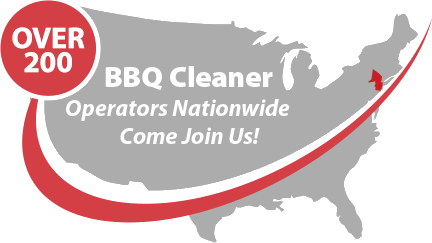 Talk to us today to find out more about this stellar BBQ cleaning business opportunity in Louisiana!